Basketball legend and businessman, Earvin “Magic” Johnson, will be the lead keynote speaker at the American Gem Society’s 2014 Conclave, the group announced. The 80th annual AGS get-together will be held at the historic Hotel Del Coronado in San Diego April 23–26, 2014. Johnson will speak about business, leadership, and his record of philanthropy, in a talk, “The Magic of Winning,” at the Conclave which begins on April 23, 2014. Photo shows NBA legend and entrepreneur, Magic Johnson, speaking at the 2009 Diversity Alliance for Science Conference that was held in Newark,NJ. The event also featured Mayor Cory Booker. Magic Johnson is considered one of the all time greats who ever played basketball. During his career, Magic achieved five NBA championships and three Most Valuable Player Awards. In 1996 he was voted one of the 50 Greatest Players of All Time and enshrined in the Basketball Hall of Fame in 2002. Johnson went on to form Magic Johnson Enterprises, a leader in revitalizing and providing quality entertainment, products and services to ethnically diverse, urban communities. 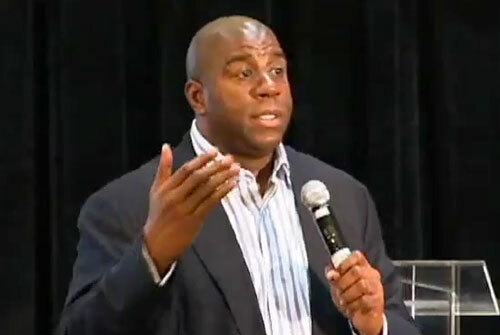 If you would like to book NBA legends or athletes like Magic Johnson for a speaking engagement, personal appearance, endorsement, or corporate event, contact our booking agent for appearance and speaker fees at Sports Speakers 360 or call 1.855.303.5450.